As one of my favorite funk outfits, the release of Lettuce's new album Crush (Let us crush, get it?) was high on my priority list. The tight horn arrangements, booming bass, flawless rhythm, and intricate guitar work that defined the Lettuce catalog were evident straight out of the bag. 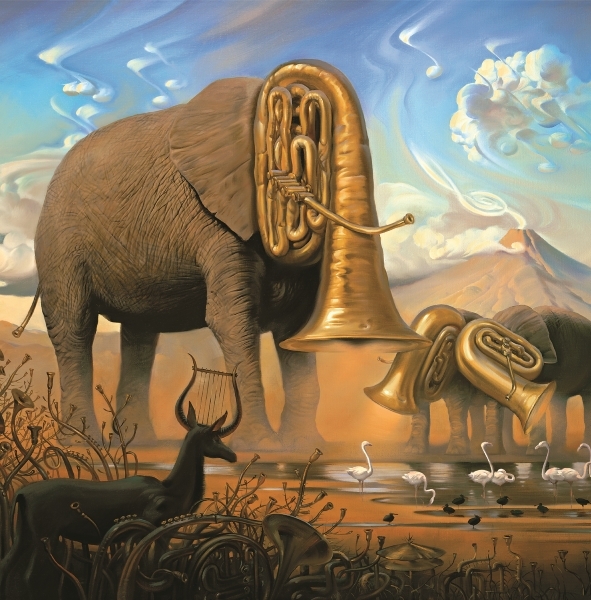 You can't always judge a book by it's cover, but the hybrid elephants and deer were "instrumanimals," providing a visual aesthetic that was as intriguing as the music within. "The Force" kicked things off with the sizzling horns and thumping bass I'd come to expect. In my experience, most Lettuce albums tend to smack you in the face immediately, while there was an element of that at play, this seemed to be a bit more mellow than previous albums. "Get Greasy" was typical funk, but leaned slightly outside Lettuce's wheelhouse. The airy funk seemed a tad less aggressive than I expected. Much of the sound was laid by Adam Deitch's solid brick foundation and Jesus Coomes' fat bottomed bass lines. As I have noticed Eric Krasno gently withdrawing himself from the band, they seemed to be leaning on the horns a bit more to provide the lead lines. The next tune, "Chief" seemed more like a New Mastersounds track than a Lettuce one in my opinion. The guitar riff sounded like it was straight out of Eddie Roberts pocket, and though the NMS don't have horns, they might want to consider adding them. "'Lude Part 1" was a very brief instrumental that seemed to be added for continuity's sake. "Phyllis" was the only track I had previously heard, and the groove immediately connected with me. The hip-hop influence on Deitch's drum track provided a nice compliment to the Jazz/funk fusion being laid down by the rest of the band. Groovy was the word. Really groovy. The first vocals of the album were on "Sounds Like a Party." It didn't take me long to identify the soulful voice as Nigel Hall's. While I prefer instrumental Lettuce, Nigel was usually a welcome addition, and this case was no different. "Lobbyist" further explored the laid back, soundscape vision that marked a somewhat new direction for the band. While the elements of a hard driving funk band were still evident, the sound had definitely evolved in a peaceful, laid-back direction. What can be said about "'Lude Part 2" that wasn't already said about "'Lude Part 1?" The following track, "Trilogy" seemed to regain a little of the old Lettuce style. The guitar, drums, and bass played a heavier role in this one, and I really liked it. There was a key effect that reminded me of Halloween in Compton. The tone Dr. Dre would use if scoring a horror soundtrack. The main riff got a little repetitive for my taste, but the drums were impeccable. Eventually a bit of a mariachi vibe hit, and really brought me around on the song. "Pocket Change" had a coked up smoothness to it. Speedy, streamlined, locked in a bathroom with it's buddy. But really, the energy level on this tune was excellent, and the drum work was pure brilliance. I could tell Krasno must have been more involved with this jam, as the guitar work had his signature tone and the chops were surgical. "The New Reel" harkened back to the ambient, relaxed funk of much of their new effort. The composition was triumphant and smooth, but it didn't have the punch of a typical Lettuce groove. Krasno's decreased involvement was noticeable as the band redirected the leads in many directions. The result was a smoother and more balanced feel, though it lacked the intensity that Kraz seemed to effortlessly add. "'Lude 3"... See "'Lude 2." "He Made a Woman Out of Me," featured Alecia Chakour pouring soul on an album that concentrated far more on the "one," than on soulful singing. It added dimension and depth to the album and transitioned well into the last real tune of "Crush." "Silverdome" reminded me of the earlier Lettuce offerings stylistically. It still lacked the dynamic guitar leads, but made up for it in sludgey, psychedelic, effects that immediately brought PFunk's "Maggotbrain" to mind. Not a bad way to cap the album. "'Lude 4," could have easily been attached to the end of "Silverdome," or titled "Outro," but the "'Lude" theme continued and brought everything to a nice conclusion. On the whole, I felt this album was really good, but it was surprising to me how much had changed. Overall, it wasn't so much of a change in direction as a change in approach. This album reminded me of several other bands more than it did of Lettuce, which was unusual since it WAS Lettuce. If my own love for Krasno wasn't so blinding, I'd have thought this effort was beyond excellent, but my mind refused to give up the expectations I carried in and left me wanting the Jazz guru's licks. Jesus, Schmeans, and Deitch obviously stepped up their game on this effort, and the horns were as good as ever. In the end I had to admit that it was my own expectations that left me wanting more, it was no reflection on Lettuce, who "Crushed."